Pinellas County might not be a household name but the cities and beaches within it certainly are. Located on the west coast of Florida, it is home to St Pete Beach, Clearwater Beach, Honeymoon Island State Park, Caladesi State Park, and Tarpon Springs. It is one of the most populated regions of the state as well as one of the state’s most popular regions for tourism. However, if one studies a map of Pinellas County long enough, a simple question arises. Why was an obvious recreational water route across the county not utilized? At the north end of the county, and the peninsula, we saw a potential waterway that, with some foresight from generations past, might have created a boating route across the county. Only a short channel would connect the Anclote River to Lake Tarpon, a shortcut of significant proportions. The route from the lake down to Tampa Bay is already there. As a lover of boating, the ease of creating such a route seems obvious. However, instead of such a route existing, the exact opposite is in place. A reservoir shuts off the south end of the channel, just before the waters reach Tampa Bay. The dam makes it impossible to boat from Tampa Bay into Lake Tarpon. Why would past generations decide to create such a barrier? We were curious, and so we did our research to find out. To set the record straight, for the better informed who are shaking their heads right now, we do know that the territory was in Hillsborough County back then. 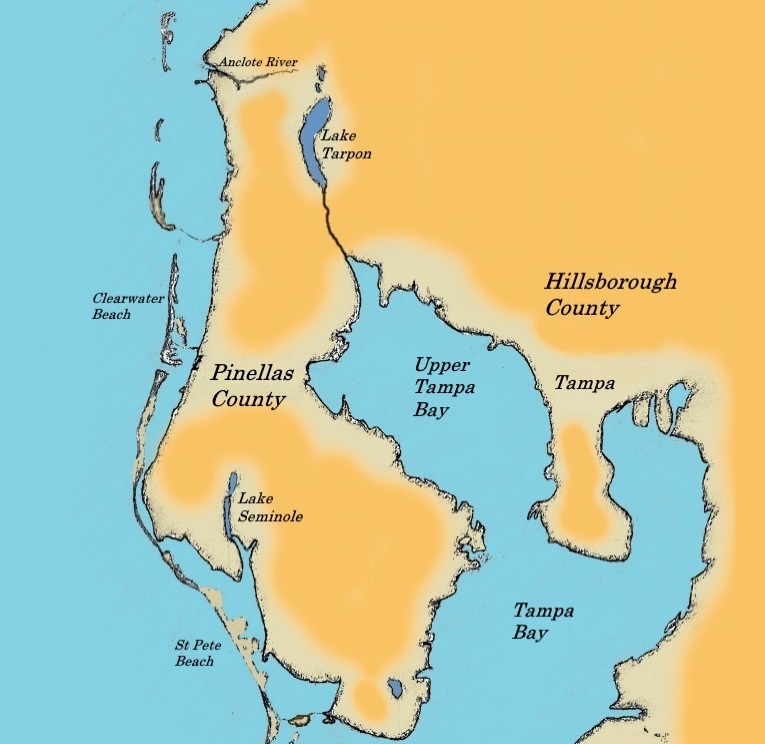 That being said, the lands that would become Pinellas County had water issues. In the early 1900’s, the lowlands of the county were akin to swamps and could not be economically developed in such a condition. Further, mosquitos bred readily in such areas. With no environmental awareness to slow them down, developers of the area drained the lowlands and turned them into farms. Well water served for drinking but making sure those aquifers stayed filled also counted high on the list. Wells could not supply enough water for livestock and farmland. Thus, the brackish bayous were dammed off, allowing them to convert, naturally, to fresh water lakes. By 1950, the developers had created the two large reservoirs of water currently called Lake Seminole and Lake Tarpon. With their creation, the water needs of the county were resolved. And that is the answer to the question of why no recreational water channel exists. The option of creating channels in present day has been voiced now and again, but due to costs and a dose of “not in my backyard,” the water channel remains a non-issue. In contrast, the two large lakes are well-known recreational areas as well as supporting much of the county’s wildlife. The county parks that surround the lakes receive an endless stream of visitors year-round. The solution to problems of former land developers have created the footprint we now live in, and current residents are quite comfortable with the results. With a casual shrug, it’s easy to agree that it’s actually quite nice.